Myrtle Beach, SC | Ocean Lakes Family Campground, a subsidiary of The Jackson Companies, has been named the top mega park in the country – the sixth time the family-owned campground has earned the industry’s highest award. Ocean Lakes Family Campground in Myrtle Beach, S.C., is named the 2017 Mega Park of the Year by the National Association of RV Parks and Campgrounds at its annual conference Nov. 9, 2017 in Raleigh, N.C. Pictured, from left to right: Johnny Williamson, Chairman of the Board of Directors for The Jackson Companies, the parent company of Ocean Lakes; Joe Mize and wife Jeanne Jackson Mize, daughter of the co-founders; Barb Krumm, Ocean Lakes Director of Marketing and PR; Kaki Jackson Williamson, daughter of the co-founders; and Paul Bambei, President/CEO of the National Association of RV Parks and Campgrounds. 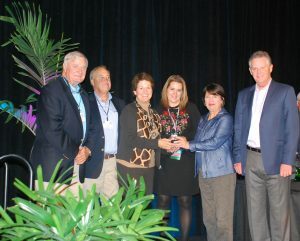 The National Association of RV Parks and Campgrounds (arvc) presented Ocean Lakes with the coveted “Mega Park of the Year” award during the association’s annual conference this month in Raleigh, N.C. The award is given to the campground that consistently delivers exceptional guest experiences as a result of its all-around excellence. The largest campground on the East Coast, Ocean Lakes boasts a variety of lodging including 859 campsites and 2,565 annual lease sites featuring beach houses and mobile homes that are available to purchase or rent. Guest amenities include nearly a mile of oceanfront, Sandy Harbor Water Park, Sandy Mart, Meet n’ Eat, an award-winning Recreation program and more. The gated campground also features an RV Center with a store and repair technicians; Golf Car Sales, Service and Rentals; camper storage and 24/7 security patrol. The 310-acre park is open year round and accommodates between 25,000 and 35,000 guests a day during an average summer day. The national association selects a top campground for the Park of the Year award in small (0-100 sites), medium (101-250 sites), large (251-499 sites) and mega (500+ sites) divisions. To earn the honor, a campground must deliver consistent exceptional guest experiences as a result of all-around excellence in operations, professionalism, marketing, customer service and industry involvement. Nelson and Mary Emily Jackson opened Ocean Lakes in 1971 with 30 campsites and one bathhouse and operated the campground until they passed away in 2010. The Jacksons’ five daughters still own Ocean Lakes and guide its growth, including the addition of a high-end, resort-style water park in 2016. Johnny Williamson, Chairman of the Board of Directors of The Jackson Companies, credited the teammates, management and family with successfully transitioning the campground to the next generation while maintaining the core values that made it special from the start. That makes winning this year even more special, he said. Ocean Lakes Family Campground, a division of The Jackson Companies, is the largest campground on the East Coast and one of the largest in the United States. Located in Myrtle Beach, S.C., it has received numerous awards for excellence. It is the 2017 National Mega Park of the Year and has received that honor from the National Association of RV Parks and Campgrounds (arvc) six times. Ocean Lakes received the TripAdvisor® Certificate of Excellence for consistently great guest reviews on the travel-planning website in 2013, 2015, 2016 and 2017. In 2006, Ocean Lakes received the prestigious South Carolina Governor’s Cup for making a significant economic impact on South Carolina. Ocean Lakes covers 310 oceanfront acres with nearly one mile of beachfront. It offers 3,424 sites – 859 of which are large and pull-through to accommodate larger RVs. It was built by Mary Emily and Nelson Jackson and their five daughters, starting in 1970. It opened with 30 campsites and one bathhouse in 1971. On an average seasonal day, Ocean Lakes has 25,000 to 35,000 guests enjoying the countless amenities that have made it a local favorite and a national vacation destination. It holds a perfect 10/10*/10 rating from the Good Sam RV Travel Guide & Campground Directory for its overall operation, recreational offerings, services and appearance. This puts Ocean Lakes Family Campground in the Top 1% of the private campgrounds in North America. In 2010, it received the Earth Day Award from the South Carolina Department of Health and Environmental Control for its iCare Program.